What is the best knee width in Breaststroke? My daughter is 12 years and has recently begun competitive swimming. My question is what is the optimum knee width for breaststroke? 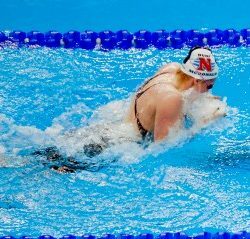 In breaststroke, the knees will come apart to a width slightly wider than the shoulders as the legs are recovering and preparing to kick backwards. It is important for the knees to stay inside the line of the ankles (so that the ankles are wider than the knees) so that when you kick back, the water is also felt on the inside of the bottom half of your legs. With the kick, swimmers should be encouraged to kick with the correct pattern firstly and then once their technique is good, swimmers should accelerate their kick backwards until the balls of their feet come together. How Many Hours Should I Train? 3 Responses to What is the best knee width in Breaststroke? I’m Vietnamese, I’m learning breastroke, but I can’t breath when my head up and down, Breathing out then stoped. Breathing in breaststroke is very important. When your face is in the water, you need to blow out quite quickly through your nose and/or your mouth to exhale a majority of the air. As you breath in, take in a large amount of air and then as soon as you put your face back in the water start exhaling again. By doing this continually, you will solve your breathing problem. Also, have a look at the video on https://theswimmingexpert.com/breaststroke-technique-when-to-breathe/ as this will help you too. Thanks so much, I’ll try to practice.